Voiceover work involves sales, and not just when we book a commercial. Sales. To this day that word makes my stomach turn just a wee bit queezy. Okay, maybe not the word itself, but the concept of it as a profession, my profession, makes my palms sweat and my blood pressure elevate. It’s only natural I suppose – sales is the only job I’ve ever been fired from. And I totally deserved it. Without going into too many specifics, let me just say that the position in question was not inside sales or retail, where an interested potential customer might walk in the door of the business and allow me to show them my wares, with me eventually enticing them to buy one, two, make it three and I’ll throw in a puppy! THAT was no problem. Upselling? Sure! Dynamic pricing? If that’s the way the business operates, pass the calculator! Maybe I was too empathetic towards the folks I imagined would answer the phone. I hate getting sales calls myself and I was sure the people on my cold lead list felt the same way. No matter how much I fortified myself with caffeine courage, or how many motivational tapes I listened to in the car on the way in, one grumpy person on the other end of the line and I was toast for the rest of the day. That phone might as well have been wired to shock, that’s how hard it became for me to pick it up and make the next call. Or maybe there wasn’t enough financial motivation to succeed? If there was no money in it, why do it, right? Unfortunately for my ego, that one doesn’t fly either. The real sales pros in the office enjoyed a very lucrative commission structure – i.e. they made bank. The business was sold years ago, but I’m sure those folks are living quite comfortably from their earnings wherever they landed. Sales success was in their collective DNA. At this point I should say that I have a great respect for professional salespeople. Others might place them somewhere between politicians and tax collectors on the scale of least favorite folks to invite to a party. Not me – I believe we need these brave souls out there day after day, hitting the pulse button on the gigantic blender that is our economy. Without them there would be a lot less punch in our GDP. Okay, so if I didn’t despise the job per se why were my former co-workers killing it while I bombed? Eventually I had to face facts and admit that my failure came down to one thing: a paralyzing fear of rejection. There, I said it. In retrospect I guess I should be grateful to the owner of the company for firing me so that I could pursue a career in a field where I wouldn’t have to deal with sales tasks or rejection. I became a stage, on camera and voiceover actor! You can quit smirking now – I’m kidding. Boy, am I kidding. Though we may shy away from calling it what it is, sales is a critical part of building a career as a professional performer. “What do I care about sales?” you might ask, “That’s what my agent is for!” But how do you go about acquiring agency representation in the first place if not through cold contacting? How can you land on the talent roster of a studio or production house if they don’t know you exist? 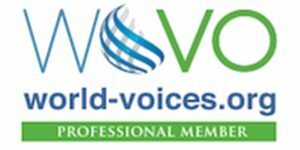 Looking to establish direct relationships with a company to handle their HR or skills training voice work? You pretty much have to find and contact people you want to work for and with – rarely will they reach out to you. Even auditions are a form of sales proposal or bid. Unlike most industries, we often have to actually do the job, or at least a significant portion of it, in order to be considered to do the job. That’s sales, production and customer service all rolled into one, and usually completely on spec. Think about that! On second thought, don’t – it’s too depressing. Back on topic: sales is sales, right? Based on my track record I should have crashed and burned at this performer stuff by now, but I haven’t. Make no mistake, I’m still only in my second year of trying to do this full-time and some months are waaay better than others, but the fact remains; I’ve had a lot more success at cold calling for my own business than when I tried to sell widgets for someone else. Why is that? In the next couple of posts I’ll be trying to answer that question while pointing out some of the obstacles we put between ourselves and success. I’ll also share how consciously tweaking my mindset about sales has helped me to overcome some of my aversion to it. First up: The Imaginary Enemy pt 1. In the meantime, please sign up over in yonder sidebar for my new mailing list, and don’t forget to follow me on FB, Twitter, LinkedIn, etc. Talk at ya’ soon!